Quick sketching is the best technique you can use to stay finely tuned and to keep those creative juices flowing. To keep your sense of observation heightened, and to sharpen your hand-eye coordination, an animator needs to constantly draw and sketch. Quick Sketching with Ron Husband offers instruction to quick sketching and all its techniques. From observing positive and negative space and learning to recognize simple shapes in complex forms to action analysis and using line of action, this Disney legend teaches you how to sketch using all these components, and how to do it in a matter of seconds. On top of instruction and advice, you�ll also see Ron�s portfolio of select art representing his growth as an artist throughout the years. Watch his drawings as he grows from a young, talented artist, to a true Disney animator. Follow him as he goes around the world and sketches flamenco dancers, football players, bakers, joggers, lions, tigers, anyone, and anything. 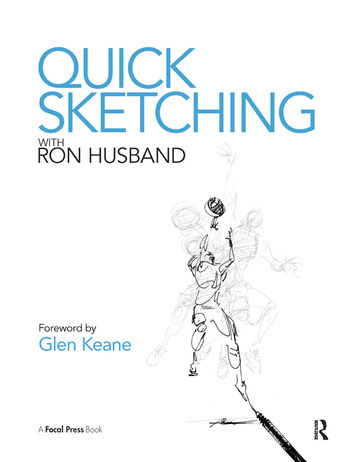 As if instruction and inspiration in one place weren�t enough, you�ll find a sketchbook included, so you can flip from Ron�s techniques and work on perfecting basic shapes. Or take your book on the road, read Ron�s advice, sketch away, capture the world around you.